This group of cotton prints is from the Alphabet collection by Marcia Durse. Bold colors and unusual combinations give the designs over-dyed and resist-print effects. The abstract forms are fantastically modern! We have a group of adorable new cotton double gauze, all in soft baby prints. Use it to make the softest swaddling and receiving blankets, as well as all kinds of garments for babies and kids. This bright, wonderful Dr. Seuss quilt was made by professional longarm quilter Nanette Sutherland. There's so much detail in the quilting design! See the fish? You can get the panel and coordinating print for your own unique creation! If you're interested in having Nanette quilt your quilt, give us a call! This week's Treadlette is Ardus! Ardus started sewing when she was about age 13 on "an old Singer that only sewed straight, with no back stitch." Wow! That's proof you don't need the fanciest machine to sew well. She's been at Treadle quite a while. "I started Treadle in 1989...! Oh my - that's 27 years!!!" I asked Ardus what she likes to sew. "Clothing for myself, though I loved sewing for my daughter when she was a baby, then a toddler, and in grade school; I also enjoy some home dec projects. "My favorite fabrics are linen and wool but I will also sew with cotton and silk. I prefer woven fabric but will sew with knit if I like a pattern that requires it. "I am currently sewing a Marcy Tilton knit dress (Vogue 8975). It's incredibly convoluted. VERY unusual pattern pieces!" Ardus is often spotted wearing garments she has made, particularly pants and blouses with a casual, comfy fit that still looks refined. One favorite she has sewn repeatedly: "Linen pants from Sewing Workshop patterns." Other favorite projects of all time? "A silk dupioni suit with a Laura Murray kimono fabric piece sewn onto jacket back. Also, years ago, a short wool, lined jacket cut and sewn from a men's wool coat that had not been worn much. Many others that I have long forgotten, worn out or given away!" Her advice for sewing? "Be inspired!" Thank goodness there is so much inspiration to be found at Treadle! Now's the time to start sewing holiday gifts! Quilts, pillows, pajamas, tote bags, and so much more make perfect gifts - and they are even more fun in Christmas and winter themed prints! Plus, we have several coordinating panel prints! 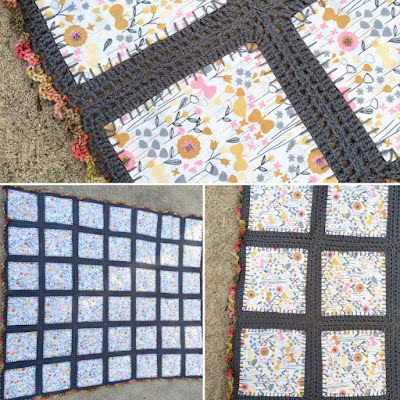 Sized for place mats, quilts, and throws, plus one little fabric book! Winter is almost here, and that means warm fabrics, like wool. These all wool double knits are smooth, drapey, and perfect for your fall and winter wardrobe. Their weight makes them ideal for pants, dresses, skirts, and layering tops like jackets and classy sweatshirts. Plus, we have a couple in pure cashmere, like this grey sweater knit that's soft as a cloud. There are a lot more wool knits in the store! Stop by and see! Treadlette Rebecca is a truly amazing seamstress. She has been at Treadle 19 years and also sews professionally as a theater costumer at the Opera. Her style is all about originality and glamour, whether making jeweled and feathered confections or everyday clothes that are anything but ordinary. Rebecca started sewing in 4-H when she was 9. "My very first project was a reversible skirt." Nowadays? "I really do like to make it all- clothes for me, costumes, doll clothes, tailored suits. I love wools and specialty fabrics." One "specialty fabric" project of Rebecca's I personally loved was this pink feather skirt. Delightful! Rebecca shared a few gorgeous doll dresses she recently made. I can see why she loves doll clothes! The small scale is the perfect canvas for experiments with fancy fabrics and new styles. Rebecca has a fearless spirit when it comes to sewing. "Just do it! Don't be afraid to try - you'll learn from every project even if it doesn't turn out exactly how you think it will!" 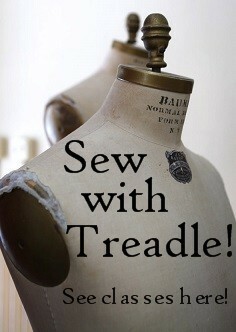 Grand Avenue Closed - But Treadle is OPEN! Grand Avenue will be closing for water and sewer work, from Lexington Parkway to Albert (one block west of Hamline Avenue, starting Monday, October 17. The project is expected to last 7-10 days. There is parking on Hamline (next to our store) and across Grand Avenue. Additional parking can be found on Lincoln Avenue (just south of Grand), however, please note that Lincoln is a one-way east to west street. New in silks! These silk and cotton blend fabrics are the best of both worlds. With a twill weave that's baby-fine and a soft, lightweight drape, you may have just found your perfect new blouse fabric! We have some new Liberty prints in the store! These silky smooth cotton lawns with Liberty's fabulous designs are irresistible! Today we are chatting with Treadlette Jennifer! Jennifer has worked at Treadle part time off and on for the past 16 years. She is a bold, bright force of creative nature! I asked her what particular fabrics or techniques inspire her. "I just plain love fabric…all fabric. I grew up with a sister who was a tailor and a sister who was a home economics teacher and a sister who loved fabric and sewing machines." Her love of fabric certainly inspired this Liberty Lawn top - made a few years ago and shared here on our blog. This delicious fabric makes it so special! Jennifer is into a lot more than apparel sewing, too. "I have been published in interweave press for purses that I designed and constructed, made the wood handles and bead embellished. I love embroidering and doing hand sewing; needle and thread is my favorite. I can sew clothes but I love fabric for all sorts of other things. I have made quilts, wall hangings, rugs, doll clothes, cushion covers, curtains……on and on." Handwork is definitely one of Jennifer's strengths! Last week she shared this mixed-fiber-media baby blanket with us. The self-lined cotton lawn squares are joined with rows of crochet. Jennifer shared her feelings on how sewing can be a deeply emotional part of our lives. "I am a woman in recovery and being creative is part of my recovery process. I think sewing and creating something is my form of meditation, it calms me down and lets me live in the moment. "I love working at Treadle because it gives me the opportunity to work with the most amazing women I have ever known. My co-workers are so smart, creative, caring, authentic, and sincere. I am the luckiest woman I know." Thanks, Jennifer! We are certainly lucky to know you! There's more Treadlette Tuesday, every week! Colette Moneta class is coming up next week! Using Moneta from Colette patterns, you can make a great, flattering knit dress that's fun and easy to wear! This class is ideal for learning how to sew with knits. If the full gathered skirt is not your thing, try the Moneta-Wren mashup! Make the Moneta bodice with the smooth, gored skirt from Colette's Wren pattern. Like this great Moneta-Wren mashup made by Treadlette Nina! You can find the full class info at our classes page, or just call us at (651)698-9690 for all the details! Our Fabulous Fall Sale continues through Tuesday! Stop by and save 20% on every fabric, including knits for your Moneta! Brocade fabrics are always rich and gorgeous, and they are particularly on-trend this season. From classic satin brocades to modern, abstract patterns, the common thread is lush woven texture. Our starts Fabulous Fall Sale starts today! For a limited time, get 20% off ALL fabrics, including these brocades!